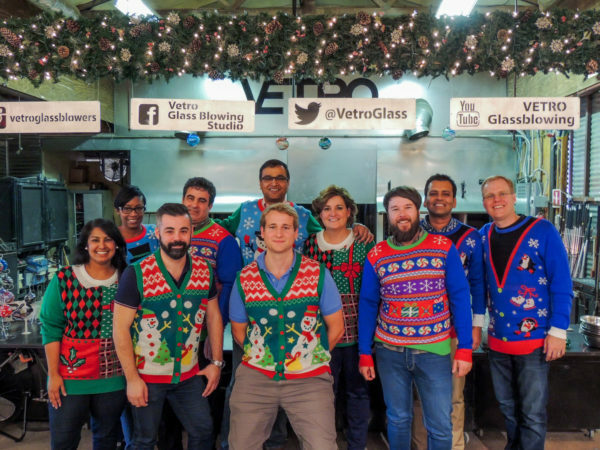 Vetro Glassblowing » TRADITIONAL ORNAMENT EXPERIENCE!!! Traditional has no reservations, first come first serve! Bring the whole family to the Vetro Studio for a fun and unique experience. Our Ornament Help-Creates are great photo opportunities where memories and traditions are made! Details Below! Price: $30 (plus tax) per ornament – First Come, First Serve ONLY – reservations are NOT required nor will be taken. Saturday, November 24, 2018 – 10:00 a.m. until 1:00 p.m. and 2:00 p.m. until 6:00 p.m.
Sunday, November 25, 2018 – 12:00 a.m. – 4:00 p.m.
Saturday, December 1, 2018 – 10:00 a.m. until 1:00 p.m. and 4:30 p.m. until 7:00 p.m.
Sunday, December 2, 2018 – 12:00 p.m. until 4:00 p.m.
Friday, December 7, 2018 – 4:30 p.m. until 7:00 p.m.
Saturday, December 8, 2018 – 10:00 a.m. until 1:00 p.m. and 2:30 p.m. until 7:00 p.m.
Sunday, December 9, 2018 – 12:00 a.m. until 4:00 p.m.
Saturday, December 15, 2018 – 10:00 a.m. until 1:00 p.m. – 5:30 p.m. until 7:00 p.m.
Sunday, December 16, 2018 – 12:00 a.m. until 4:00 p.m.
Thursday, December 20, 2018 – 2:00 p.m. until 6:00 p.m.
Friday, December 21, 2018 – 4:00 p.m. until 7:00 p.m.
Saturday, December 22, 2018 – 10:00 a.m. until 1:00 p.m. and 4:30 p.m. until 7:00 p.m.
Sunday, December 23, 2018 – 12:00 p.m. until 4:00 p.m.
Watch the glassblowing artists finish creating your ornament right before your very eyes. Due to the nature of glass, there is a possibility that your glass art piece could break or crack during the cooling process. If this happens, we have three different options: (1) You may choose out of the Help Create color mixes and your art work will be created for you. 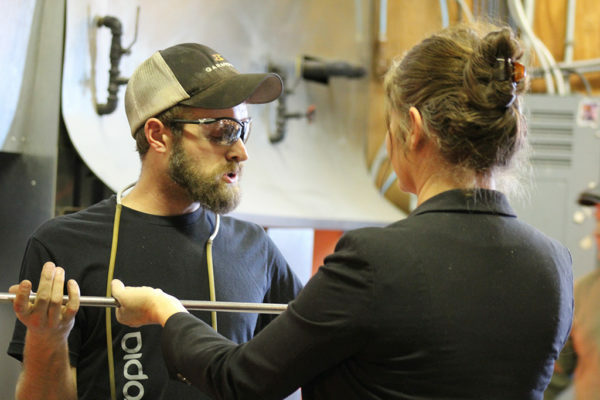 (2) You can choose the same type of art glass piece form Vetro’s gallery; (3) You can schedule a time to come back to the Vetro’s Studio and re-make your art glass piece! Kids of all ages are welcome to participate (children under 18 must be accompanied by a parent or legal guardian in the gallery and in the studio at all times). Traditional ornament Help Creates will be taking place during the given dates and times, typically the first hour is a higher traffic volume. We ask in order to have enough time to create your Ornaments that you check-in no later than 30 minutes prior to gallery closing times. Vetro’s Studio + Gallery will be CLOSED Thanksgiving, Christmas Day so our hardworking staff can spend the holidays with their families and friends! Sunday’s: 12:00 p.m. – 4:00 p.m.
Monday, December 3rd 10:00 a.m. – 6:00 p.m.
Monday, December 10th 10:00 a.m. – 6:00 p.m.
Tuesday’s, Wednesday’s, Thursday’s 10:00 a.m. – 6:00 p.m.
Vetro’s parking lot becomes a Winter Wonderland during the month of December due to Grapevine’s “North Pole Express”. 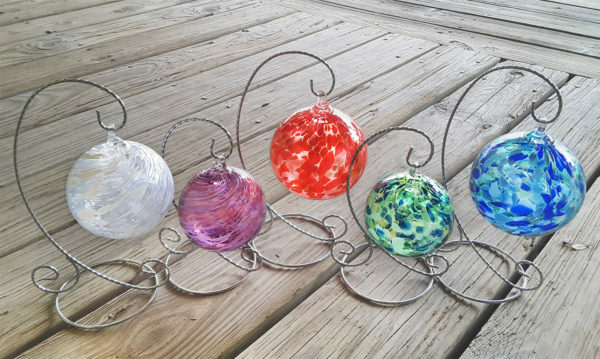 If you wish to “Help Make Your Own Ornament” or just browse through the Fine Art Glass Gallery for that “One-of-a-Kind Hand-blown Gift”, feel free to park behind the Studio under the Glassblowing Sign on Hudgins Street, or just across Main Street. On the weekends during the North Pole Express, a shuttle service will also be available. Free shuttles run continuously from the free parking at the Grapevine Convention Center to the North Pole Express. 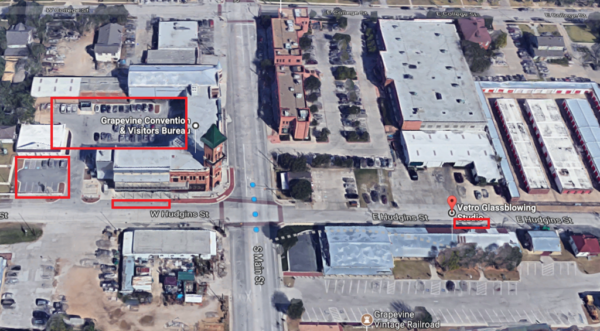 *Designated Parking area is to the east of the reserved Library patron parking. Reservations are available during other times of the week for groups with a minimum of 15 or more. Please call the Vetro Gallery for to schedule your group’s Christmas Help Create Events at 817-251-1668. Please use the form below to get in touch with regarding questions and or comments. We’d love to hear from you! Great Teams Working Together to Accomplish Fiery Results! © 2019 Vetro Glassblowing. All rights reserved.